You must be a member of the Basel Culture & Lifestyle Group to attend this activity. Would you like to join this group? Sudheesh is running 1.5 hours + Candlelight Yoga class on Sundays at 4.30 pm to 6.00pm Ish...! He adds the postures, which is easy to adopt for the people who are beginners, experienced people or even someone who never tried yoga before. body as well the mind. And there are breathing exercises (Pranayama) around which is really helpful to strengthen the respiratory system and release the stress of the day to day life and improve the flow of energy in the body. At the end of the class, he will guide you through deep Yoga Nidra meditative relaxation that refreshes your body, mind and the spirit-he focuses on different subjects each week- Eg: Anxiety, Insomnia, Stress, Gratitude, Chakra meditation etc. . .. more. This Sunday there will be a focus on Pranayama- Sun salutations - And deep deep relaxation for anxiety and the stress with special musics - You are free to bring your dears people still don't practice Yoga. 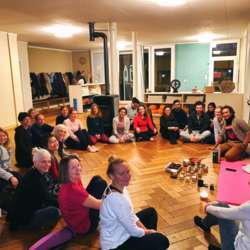 NOTE: Purpose of this class is also to afford Yoga for the people who don‘t earn enough money even for their living and not able to find the money for their well being although they want to do it.